Plan for the plant’s mature size and locate it accordingly to allow for easy bi-annual maintenance. Remove pups, dead leaves and spine tips (as desired). Dramatic large landscape or specimen plant, xeriscape, excellent in large rock gardens, succulent and cactus gardens, barrier plantings. Striking for large containers. Plant is monocarpic and dies after flowering. However Agave americana produces abundant seeds after flowering. Pups can be detached and replanted at any time. Leaves have recurved spines on their margins and a long terminal spine. Care must be taken to locate this plant away from foot traffic. When a plant blooms, it sends up a single erect flower stalk from the center of the rosette which can reach 40 feet in height. The flower stalk resembles a narrow telephone pole with horizontal branches that hold the flowers spreading out at the top. 3-4 inch greenish-yellow flowers bloom sequentially in panicles at the branch ends. The plant is deer resistant. Its sap can irritate skin – so do not trim with a chainsaw. 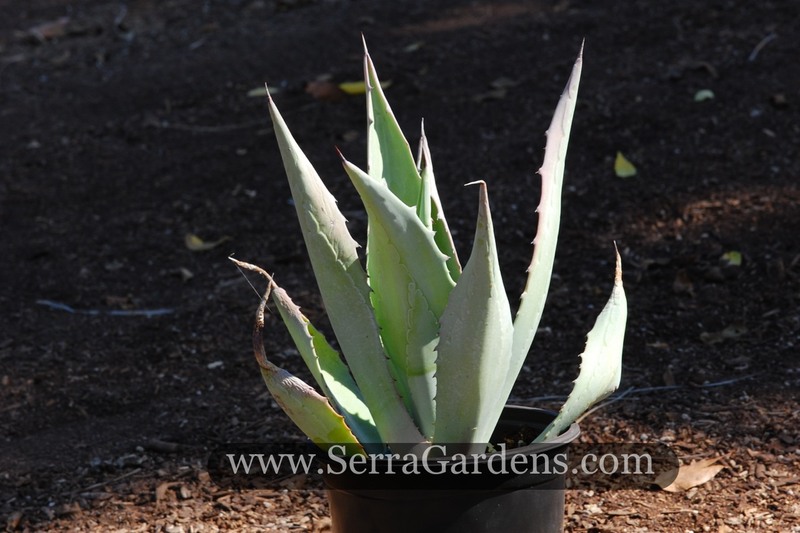 Agave americana grows faster in summer with some additional irrigation.